Since Windows 2000 there were always three editions of server operating systems, standard, enterprise, datacenter limiting HW resources available for use. With Windows 2012 we are losing Enterprise edition and both Standard and Datacenter are, function wise, equal. That means you can run clustering services on standard and address same amount of CPU or RAM with both editions. When it comes to running new Windows on any hypervisor things are getting different. Sounds like Nordic twins, aren't they? :-) These are names/terminology used for physical and virtual operating system environments. You have to license each physical CPU with Windows Server license, Microsoft is referring to this as licensing POSE(physical OS environment) to enable you to run VOSE (virtual OS environment). Basically by assigning Windows license to ESXi (licensing POSE) or any other hypervisor you are getting right to run virtualized workloads (VOSE) of Microsoft Windows on same host. By purchasing Windows 2012 Standard OS you will always get single license for 2 physical CPUs and 2 virtual OS instances. For example one HP DL380G8 with 2 CPUs with single Windows 2012 standard license will cover you on POSE level and give you right for two additional virtual instances on same physical host. With Datacenter edition all above is true and in addition you are entitled to run unlimited number of virtual instances. Things are getting more complicated once you try to license 4 CPU server like HP DL580G7 or HP BL685G7 where single Windows 2012 license will only cover half of the CPUs. In this scenario you have to purchase two licenses and that will of course give you 4 virtual instances in case of Standard and (surprise) still unlimited number of virtual servers in Datacenter case. Licenses cannot be dynamically transferred across different ESXi hosts but you are allowed to reallocate POSE licenses to other hypervisor server every 90 days. As long as you have enough VOSE licenses (or slots) available you can also vMotion VMs across hosts. Picture below describes this scenario. On Host 1 you are moving all 4 VMs off as both Host 2 and Host 3 are assigned with three POSE licenses they are entitled to run 6 VMs but both are running only 4 VMs and have 2 empty slots to cater vMotion demand incoming from Host 1. 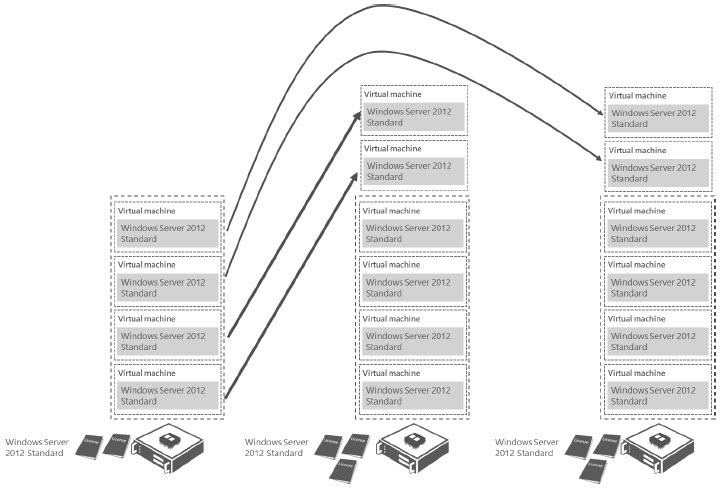 You can check http://download.microsoft.com/download/3/D/4/3D42BDC2-6725-4B29-B75A-A5B04179958B/WindowsServer2012VirtualTech_VLBrief.pdf for more details. Ever wondering how to get all virtualization platforms compared one to each other? Andreas Groth did a remarkable job starting this year with virtualization matrix. Recently he added Red Hat Enterprise Virtualization RHEV 3.1 (KVM based) to the bunch. In Part 1 we ran through basic building blocks of your virtual infrastructure. These are essential and very crucial pieces of technology helping you to create reliable and flexible environment. We still don't know how all this can be managed. There are several options and with vSphere 5 these options are even greater although we've lost ESX console. You remember...ESXi doesn't have one. I tried to pencil whole solution as described in Part 1 and what kind of management tools you can use to manage every tier of your private cloud. With vSphere 5 product line there is an improved web access portal available right after installation of the vCenter. You can find yours on default URL https://vcentername:9443. Current version is more capable than previous one included in vCenter 4.1 and you can do many basic tasks right away. Most conventional and probably also most used is vSphere client connected to vCenter server. This is feature rich and very intuitive client-server application. However it requires Windows based vCenter server we can now, with version 5, install cost effective linux based option available. VMware calls it vCenter server appliance and there is no need for additional Windows licenses you just download and install ISO. For those who, for any reason, prefers Windows free environment this could be the way forward. With vSphere client you can do all kind of operations on datacenter, cluster, esx and virtual machine like setup clusters, initiate vmotion, setup DRS, assign datastores, setup alarms and of course deploy virtual machines and appliances (from OVF files or other sources) in addition to this vCenter can be enriched with plugins such as for Update Manager for interaction with VMware Update manager patching solution, Operations Manager plugin for capacity and performance reporting and management or 3rd party plugins like vkernel's vOps. vSphere client is also used to setup permissions and atuhentication options on ESX or vCenter server. For multiple vCenter servers there is an option to create linked mode vCenters where you can join and create hierarchy similar to domain and have one tree of all of your datacenters and clusters with less administration overhead. Less convenient but very flexible is powercli, this is vmware addition to standard powershell framework and you can do all kinds of "en masse" tasks which are usually hard to perform or very complicated in terms of complexity. 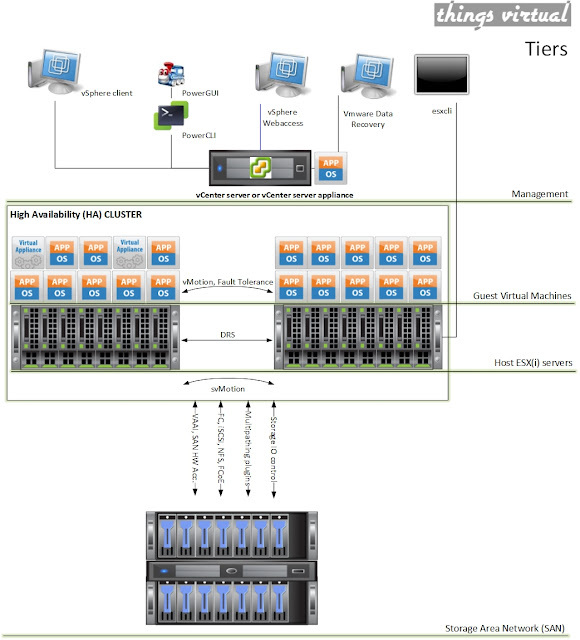 Imagine you need to perform change of policies for multipathing on 100+ SAN datastores or obtain ESX CPU, MEM and NIC info for multiple clusters connected to same vCenter. That is quite complicated and complex task to be performed through client. On top powercli you can have PowerGUI. This is free 3rd party tool with additional powerpacks for VMware so you can do less scripting and more queries and reporting right from the graphical interface. I'm talking little bit more about this brilliant tool in my previous post. Another option, to perform tasks through command line, is esxcli you can compare this one to the powercli but it uses native vmware command line syntax where you can execute various configuration commands and is meant to be used for ESX(i) management directly. On the picture above, you may notice additional "management" console called VMware VDR (vmware data recovery), it is not used as management tool for ESX or vCenter elements but it's rather used for managing backups of virtual machines. With basic installation you already have possibility to leverage from VCB (VMware consolidate backup) which you can use to backup whole virtual machine files. You can download VCB from VMware for free but going forward strategy is to use VDR as it is easier to manage and maintain. VDR is downloadable appliance in form of OVF file so you can easily deploy it within your infrastructure and utilize native ESX(i) functionality like snapshots and clones to create one centralized store of your backed up VMs. You are free to create links to this site please do not copy paste my articles elsewhere. Motív Jednoduché. Používa službu Blogger.